Higher magnification of the previous image. The nuclei contain delicate chromatin and small punctate nucleoli. 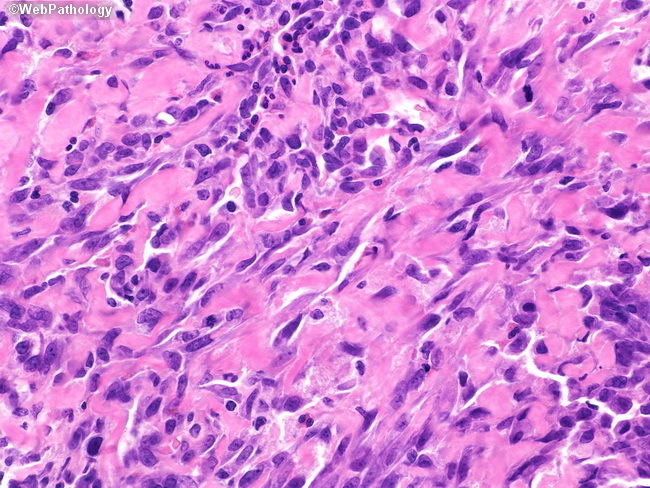 Atypical or hyperchromatic nuclei are not seen. IMTs are locally invasive and can destroy smooth muscle. Due to their infiltrative pattern, complete resection is difficult leading to recurrences in almost 25% of cases. The biologic behavior of IMTs is benign with metastases noted only in exceptionally rare cases.